Get $1.00 off two bags Malt-O-Meal cereal (any flavor 18 oz or larger). Print coupons for malt o meal brand products as soon as they are available, plus get the latest news and recipes. Take a look at our cereal page or our kelloggs coupons. You can also get some great printable's for cereals from our grocery coupon providers . 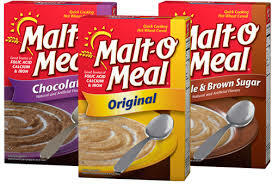 Save $.75 Off any one Bag of Malt-O-Meal Cereal over 18 oz. Save $1 Malt-O-Meal when you buy 3 Malt-O-Meal cereals 12.5 oz. or Larger. Sign up for the newsletter with recipes, tips and more.